Pain can be caused by a multitude of reasons. The Pain management program’s foundation is identifying the cause of your pain. Whether you suffer from age related arthritis, or an infection which is causing long term muscle pain, this program is designed for you. Prescription pain medications cause numerous side effects. Ulcers and gastrointestinal issues are among the most common. This pain program will address the side effects you are currently experiencing. It will gradually decrease the amount of pain medication you need to take, so you won’t need to take the medication on a regular basis. You want to get to the root of the pain, not make it disappear for a few hours. This program does just that. The initial appointment will be where your underlying cause for pain is identified. There maybe lab tests required to confirm a diagnosis. Most of the time the reason for your pain will be assessed within the first visit. From here you will be given an individualized treatment plan that will address your pain from the inside out. After the six sessions, the follow up visits space out. This stage of the program is focused on maintaining your body so the pain does not return. 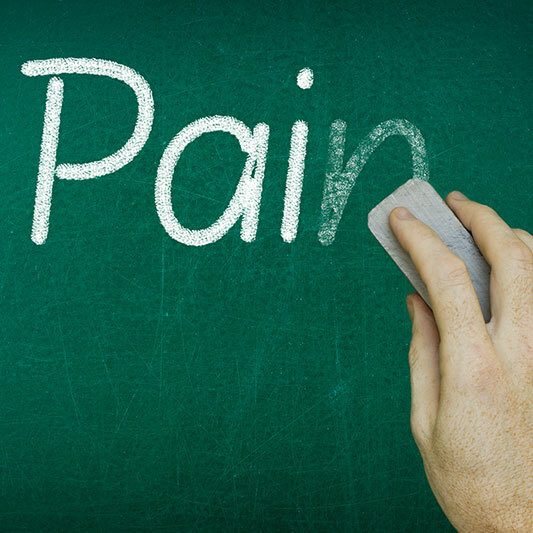 One of the biggest mistakes that happens during pain management is stopping the program once the pain is gone. There is no need to continue, right? You are healed! Patients will stop stretching, or doing their strengthening exercises. Their diet returns to what it was before. Their bad habits slowly come back, and so does the pain. This stage holds you accountable for continuing the treatment plan on your own. There are small modifications to ensure your body is supported as you progress through the program. The number of follow up treatments needed depends on the patient and how well he or she adheres to the program. Pain is debilitating and affects your quality of life. It’s time to take control of your pain and get back to doing what you love to do. Initial Appointment- assessment, base line levels are obtained, other medical conditions related to pain are identified and addressed, activities that we will work on to track your progress are determined, clinically relevant dietary advice and an introduction to acupuncture. The next 6 follow up appointments happen within 2-3 weeks. 45 min follow up appointments (2 or 3 of them)- These appointments are longer follow up appointments to ensure we can aggressively treat the cause of the pain. You will receive medical and tcm acupuncture with electrotherapy, cupping massage, body work, stretches, strengthening exercises, lifestyle adjustments, naturopathic manipulations, and other supporting therapies as required. 30 min follow up appointments (3 or 4 of them)- As you progress through this program we do not have to be as aggressive. The pain will decrease and you will not require an intense treatment. We will reassess your progress and change some of the stretches and exercises. *** Program may require more visits or a referral if counselling is required for anxiety and/or depression, which are associated with chronic pain.